Figure 7-7.-Electrode covering and gaseous shield that protects weld metal from the atmosphere. The widest range of arc welding is done with electrodes in the mild steel group. Electrodes are manufactured for use in specific positions and for many different types of metal. They also are specially designed to use with ac or dc welding machines. 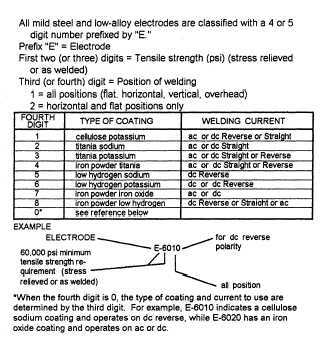 Some manufacturer's electrodes work identically on either ac or dc, while others are best suited for flat-position welding. Another type is made primarily for vertical and overhead welding, and some can be used in any position. As you can see, electrode selection depends on many variables. Electrodes are classified as either bare or shielded. The original bare electrodes were exactly as their name implied-bare. Today, they have a light covering, but even with this improvement they are rarely used because of their limitations. They are difficult to weld with, produce brittle welds, and have low strength. Just about all welding is done with shielded electrodes. Figure 7-8.-Explanation of AWS classification numbers. the molten metal from oxidation or contamination by the surrounding atmosphere. As molten metal is deposited in the welding process, it attracts oxygen and nitrogen. Since the arc stream takes place in the atmosphere, oxidation occurs while the metal passes from the electrode to the work. When this happens, the strength and ductility of the weld are reduced as well as the resistance to corrosion. The coating on the electrode prevents oxidation from taking place. As the electrode melts, the heavy coating releases an inert gas around the molten metal that excludes the atmosphere from the weld (fig. 7-7). 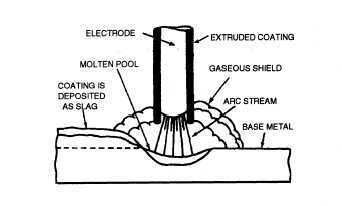 The burning residue of the coating forms a slag over the deposited metal that slows down the cooling rate and produces a more ductile weld. Some coatings include powdered iron that is converted to steel by the intense heat of the arc as it flows into the weld deposit.